Recently, I’ve been fascinated with flexible optical elements. In particular, I’ve been experimenting with gradient index lenses. Gradient index materials are typically constructed with using semiconductor processes (doping some substrate). In addition, they are typically small both because of their fabrication method and because of chromatic aberrations that are more prevalent at larger sizes. GRIN Lenses work using principles of geometric optics. Notice that according to Snell’s Law, as a beam of light enters a medium, it is bent in the direction of increasing index of refraction. Put a straw in a glass of water and observe how it appears to be bent. In a GRIN medium, the light is increasingly bent inside the medium in the direction of increasing index of refraction. Cylindrical GRIN lenses are typically used in optical communication systems. In a cylindrical GRIN lens, the index of refraction decreases radially from the axial line. Thus, when light is shone into one face of the cylinder, it is focused on the other face. 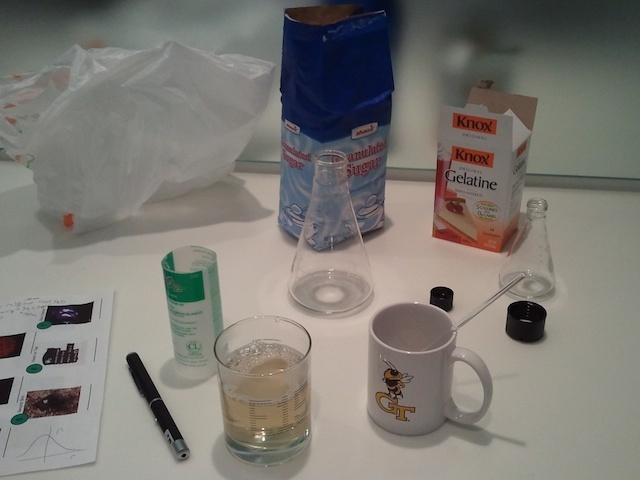 Clockwise from the laser pointer: lens mold (whiteboard cleaner bottle), sugar, gelatin, mixing glassware (flasks and coffee cups), mixed gelatin about to be poured into mold. After meeting Groot Gregory at an OSA meeting in the Media Lab, and finding this page I had a rough starting point for experimentation. A Gelatin GRIN lens is constructed by forming a concentrated gelatin mixture that is very very sweet. The lens is then immersed in cold water for a few hours so the sugar leaches from the outside of the lens. An exact recipe for a lens with around a 0.3L volume is as follows. First, mix 2 packets of Knox gelatin with 1/3 cup of cold water. Make a saturated sugar solution with 1/2 cup of boiling water. Mix the hot water with the gelatin, pour into mold and let set in the refrigerator for ~1 hour. Use warm water to release the lens from the mold. Place lens in water bath for 8-12 hours so the sugar can leach out creating a radially changing index of refraction.